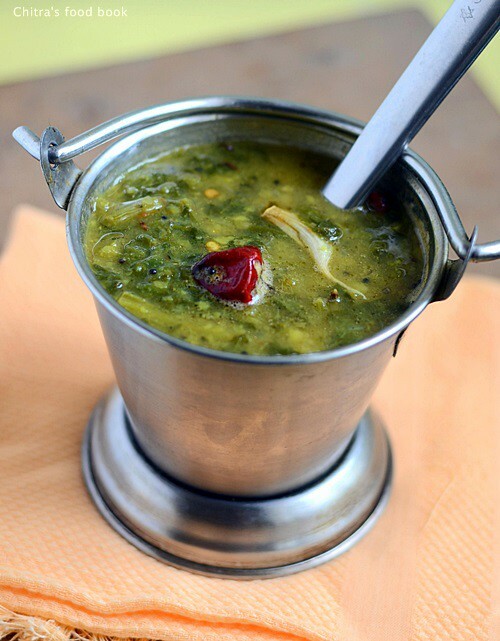 Palakura pappu/Spinach dal is an Andhra based,simple and easy one pot recipe.It can be made under 15 minutes and its a super healthy dish packed with the nutrition of dal & palak leaves.I had tasted this once in Jayanagar,Nagarjuna restaurant.Long back,I shared this Palakoora pappu recipe tried from Sailu’s food in my Andhra Lunch Menu post.This time,i tried it by getting the recipe from my friend Megha & i modified it slightly as per our taste.As her in-laws belong to Andhra,she makes this palak dal very often.Nowadays i make this for Sendhil’s lunch box whenever i don’t have enough time to prepare in busy mornings.Its a great recipe for Bachelors and working women.You can prepare this recipe at least once in a week and have a simple n healthy lunch.My friend made it spicy but i had reduced the chillies as per my family’s taste.Also Megha told me to add little tamarind extract at the end but i used tomato here.I recently read in readers comments in Vahchef's site that palak & tomato should be not be used together.I don't know the actual reason for it.So,i am planning to use tamarind extract in place of tomato from next time.Please enlighten me if u know the correct reason.Try this easy palak dal recipe for rice and enjoy ! In a kadai, heat ghee or oil and splutter mustard seeds,urad dal,red chilli and crushed garlic cloves.Saute well for a minute and add them to the boiling dal. After the dal becomes slightly thick and pourable,remove it and serve hot with rice adding a drop of ghee.Enjoy ! I read in Vahchef’s site by readers that palak & tomato should not be cooked together.I am not sure about the reason.So if u want to skip tomat,add thick tamarind extract only after cooking the dal palak mixture. If using tomato,do not chop it and add to dal.Dal won’t be cooked well n mushy.So add it as whole tomato. Make sure the dal is mashed well after cooking else the mixture will look watery and separate. You can replace toor dal with moong dal too. This palakura pappu can be done in another way.ie.Heat oil in a cooker.Temper all the spices given above and then add onions,green chillies.Saute them for a while and now add the dal and washed palak leaves.Pressure cook for one whistle. 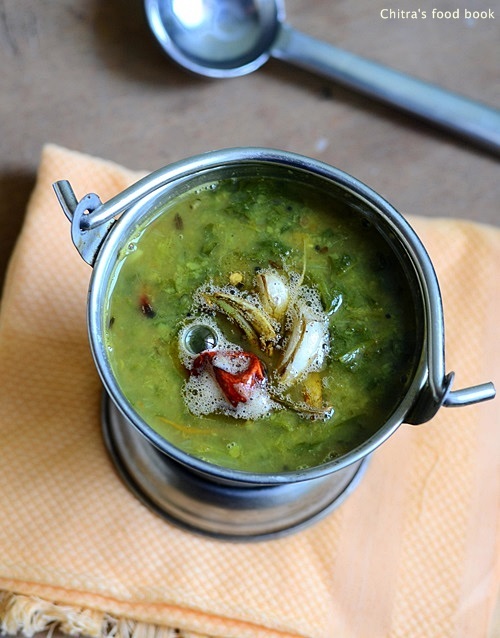 Easy,healthy Palakura Pappu is ready to relish with hot rice n ghee ! 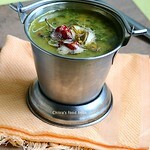 dal looks super yummy.never heard of palak can't be combined with tomatoes.any way now got to google search it hehe. Never thought of adding palak and daal. Nice combination. Really great idea and the daal too looks fabulous. this is so comforting.. this is first time I am also hearing tomatoes cannot be combined with palak.. 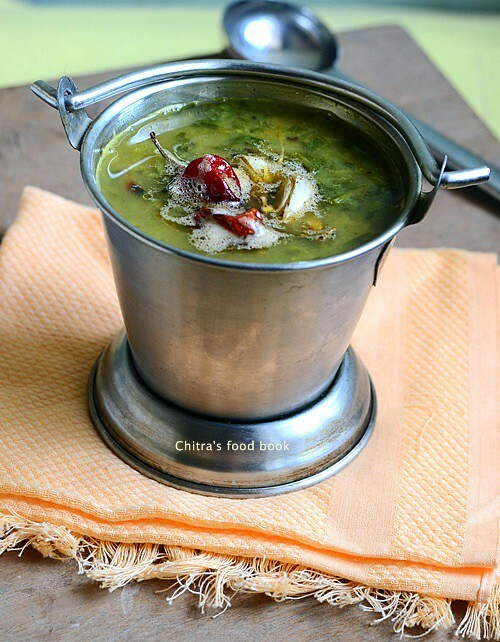 Very tempting and delicious looking dal Chitra. Very healthy and yummy!! looks very tempting!! While it said that together Palak and tomato cause kidney stones, it's based on Individual body. Drinking more water, consuming food in moderate amounts will not cause harm. If one is already having issues, they may increase. I like tomato taste better than tamarind. I also use amchur and mango when available. Different taste. Both spinach and tomatoes are rich in oxalate, which when combined with calcium forms calcium oxalate stones. They cannot be avoided completely from diet, but uptake is restricted, especially in case of individuals already having stones. For regular people, there is no need to worry because our body gets only 10% oxalate from diet and remaining 90% is synthesized by our body itself. Every 100gm spinach gives only 0.97gm of oxalate/oxalic acid and every 100gms of tomatoes give 0.05gm. So, for regular people better to check the portion size instead of completely avoiding them. Even doctors suggest the same. Avoiding leafy vegetables especially spinach is not a right option because it has high nutritional value which promotes vision and good health etc.